The characteristic feature of a memoir is that it is personal rather than technical. Former choir-members all over Sarawak and Brunei will no doubt cherish fond memories of their ‘choir days’, whatever and wherever. What follows are some of my own, and hopefully these will evoke similar memories, even nostalgia, for others and for all. 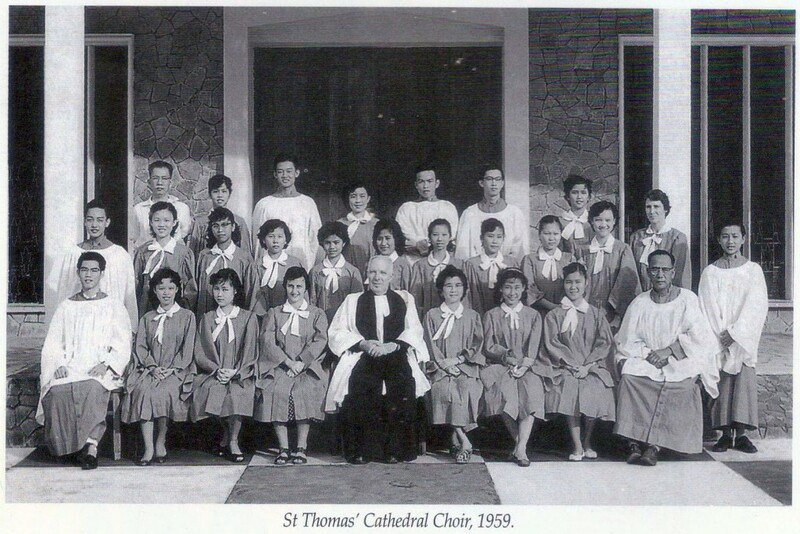 It was always my childhood dream to be a member of the St. Thomas’ Cathedral Choir. Imagine the excitement I felt in 1955 when the Choirmaster, Mr. Chin Shin Sen accepted me. I was inducted as a treble (boy soprano) and sat between Lydia Chan (now Mrs. Lydia Ng) and Lily Kong (now Datin Lily Hardin). I took to music and Anglican hymns like a fish to water. The beautiful old wooden Cathedral was in the process of being dismantled and services were being held in the ‘new’ Cathedral after its consecration. The liturgy of the Book of Common Prayer was sung to Merbecke. At Evensong we sang the Magnificat, Nunc Dimiitis and Psalms to chants in the Parish Psalter. The Versicles and Responses and the various Collects were also chanted. In the old Cathedral the hymn-book used was the green-covered ‘English Hymnal’. When we moved to the new Cathedral, we began using ‘Hymns Ancient and Modern Revised’, which is still used today. Special music would be sung for Holy Week. When Fr. Anthony Parry was Dean of the Cathedral, he would sing the role of narrator of a simplified Passion set to music and sung on Palm Sunday. He had a wonderful tenor voice. At the time, the Choir sat way up in the Gallery. Mr. Wan Thau Fen was the regular organist at most services and all three of his children sang in the choir: Michael, a bass; Steven, a tenor; and Violet, a soprano. Mr. Ted Corby would play at Evensong, and Billy Yapp, the young organ scholar then would also be given the opportunity to play, accompanying the Choir in the hymns. On Saturday evenings, members of the Choir who could attend would sing at the beautiful service of Compline, . We were not robed, but sat in the Chancel and led the singing. Christmas was always an exciting time for the Choir. What with carolling, Midnight Mass and concerts with the Kuching Music Society. mr. George Freeth of the Sarawak Constabulary Band conducting. We even sang Handel’s Messiah! The Choir would also be ferried across the Sarawak river to the Astana to sing carols for the Governor, H. E. Sir Anthony Abell. On ‘Remembrance Sunday’ the Choir would process to the Central Padang singing ‘O God Our Help in Ages Past’. All Souls Day would see the Choir processing from the Cathedral to the graveyard (next to St. Thomas’ School Boarding House) with the Dean leading the way. The Litany would be chanted in procession. At the graveyard itself the Choir would sing the (English Hymnal No. 744), Russian Contakion of the Departed and ‘Abide with Me’. In Mr. Chin Shin Sen’s absence, Miss Audrey Oldfield conducted the Choir. Miss Ruth Duncombe, Principal of St. Mary’s School, was a powerful alto with a rich contralto voice. She held this part for many years. When my treble voice deepened, I sang alto and sat between her and Rebecca Chan. Mr. Harold Woodall, an Australian who taught English at St. Thomas’, sang bass. He was also my General Paper teacher at St. Thomas’; a kindly man, a fine bass and an excellent educator. The highlight of the year was the Annual Choir Picnic, over a weekend followed by a public holiday. The most popular spot was Kerangan; the Senior Service Bungalow in Santubong was second choice. The trip to Kerangan would take about three hours by motor launch. Ee Poh Teck had access to Mr. Tan Boon Tian’s launch “Be-Be”. Slow but safe. Dean Parry would always come with us and Holy Communion by the sea was particularly meaningful. The liturgy would be sung followed by the communion hymn ‘Faithful Shepherd feed me‘. Meal times were fun and Mr. Ted Corby would be looking forward to his pineapple salad, only to discover that it was pineapple rojak. He would attempt to wash off the prawn paste, “an impossibility” he would say. “It’s like trying to get rid of the taste of durians in your mouth!” We never discovered what Miss Duncombe and the Dean thought about rojak. Evensong was most memorable : the sun setting, the tide going out and the Choir singing ‘The day thou gavest, Lord is ended‘. Mr. Chin the Choirmaster would never fail to bring to the notice of one of the altos that she had sung a wrong note in the third line. Once a month, the Choir would have a recording session at Radio Sarawak and this would be aired over the radio on the Sunday evening as part of Christian worship. Every other Christmas, the morning service would be broadcast live over the radio. When my voice was finally that of an adult, I sang tenor and sat between Steven Wan and Robert Jacob Ridu. I remained in this part until I left Kuching for Canada to further my studies. My time with the Cathedral Choir in Kuching enabled me to discover the unrivalled beauty and richness of Anglican church music. I continued to sing in Canada and also during my time in England. The memory of my sing days at St. Thomas’ remains fresh because my time in the Choir, over eight years, was both meaningful and enjoyable. 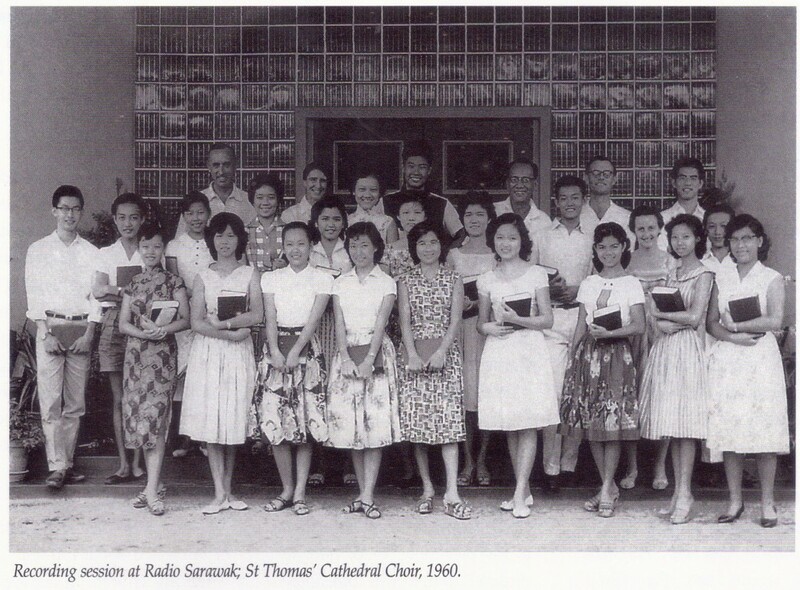 Very little has been written or published about music in the Anglican church in Sarawak. Mrs. Harriette McDougall, wife of Bishop McDougall, mentioned in her memoirs that she had taught the children how to sing hymns. 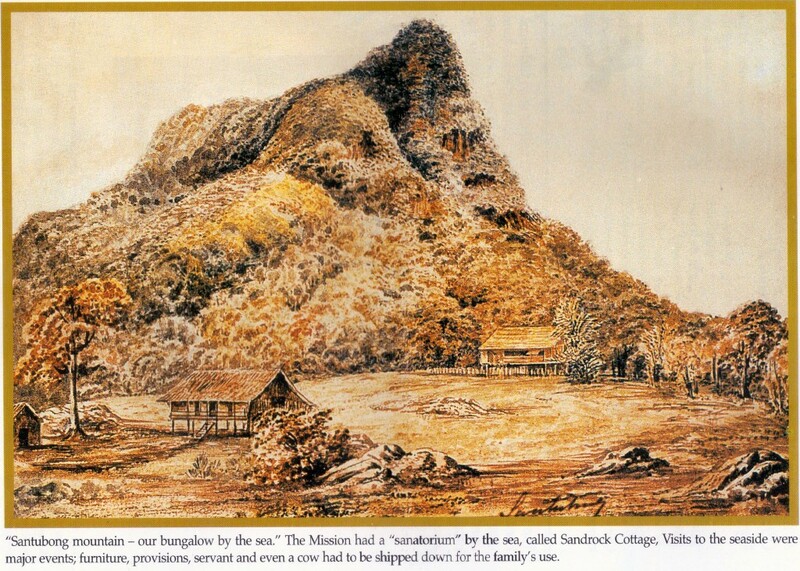 Brian Taylor in his book “The Anglican Church in Borneo – 1848-1962” mentioned that “At Quop Abes musical ability was showing its usefulness”. Today many Anglican churches in Sarawak can boast of a choir. And hopefully, with increased musical literacy in time the repertoire will expand to include the very best there is in Christian music. Some in the Church will prefer the old to the new, while others will embrace the new and discard the old. Those who love the old hymns may find these being replace by ‘choruses’ with a new beat, often weak in theology, repetitious and targeting the heart rather than the mind. Some are at home with sound of the choir and organ. Others prefer the tambourines, guitars, drums and synthesizers. Some find it more meaningful to clap and dance to a strong beat. The more ‘traditional’ are put off by what to them is the irreverent, experiential, superficiality of the charismatic service. Some ‘charismatics’ find little meaning in a traditional service. In some churches these tend to create tension and confusion. The potentially divisive effect remains between traditional and the new but if seen positively can become a challenge and a means to unite old and new, young and old. In those churches where this has been resolved, it has served to only enrich the worship of the church. To quote Lionel Dakers, a former Director of the RSCM, “the changing world and the changing church do not necessarily imply a need to abandon proven and valid traditions“. Simone Weil had a very positive way of looking at tradition when she said, “tradition does not consist in keeping old ashes but in keeping the old fire burning by continually adding new fuel“. Perhaps Lionel Dakers sums it up succinctly: “the completeness of our offering, so that worship can truly become the meeting place of earth and heaven, will without doubt be more nearly achieved through the enrichment which music uniquely offers and this will be realised if we have vision with one eye on the past, one eye on the present and both eyes on the future“.